Power-charge your dreams. The jackpot starts at $40 million. Each play costs $2 and you can add Power Play for just $1. The Game of a Lifetime®. 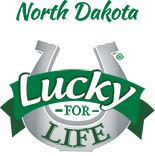 Lucky for Life has a top prize of $1,000 a day for life and a second prize of $25,000 a year for life! Each play costs $2. Mega-size your dreams. The jackpot starts at $40 million. Each play costs $2 and you can add Megaplier for just $1. Your Ticket to Opportunity.The jackpot starts at $2 million. Each play costs $1 and you can add All Star Bonus for just $1 more per play. Thousands of North Dakota winners every day. 2by2 is played every day of the week, has excellent odds, and the jackpot is $22,000.